A dystopian sci-fi novel about baseball? You bet! It's 80 years into the future—and the game of baseball is regarded on the same moral plane as treason and terrorism. In this post-WWIII world—decimated by radical Islam—America is ruled by a despotic mother-figure named "Grandma". As a counterpoint to all the hatred in the world, she urges us all to adhere to principles of love, honesty and ethical behavior. Social media, entertainment—and, of course baseball—are verboten. In the midst of all this, a baseball historian named Puppy Nedick (along with some players and fans) sets out to make the last season of baseball (to be played at Amazon Stadium in the Bronx) as meaningful as possible. 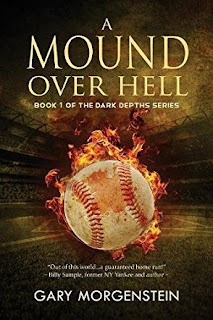 This is the premise behind Gary Morgenstein's fantastic new novel, "A Mound Over Hell". From there, he takes readers on a topsy-turvy ride that is utterly unique for a baseball-themed work of fiction. Morgenstein is not afraid to step on some 'politically-correct' toes, either—which in and of itself is refreshing (making the narrative all the more believable). But what makes this book so entertaining goes well beyond baseball or speculative fiction. Morgenstein is a brilliantly-skilled storyteller, who will keep you enthralled to the very end. And, it's only a temporary "end", by the way. "A Mound Over Hell" is just book one of the "Dark Depths" series of novels—there will be more excitement to come. So, if you love baseball, politics (and an occasional ghost here and there), you will love this book. We recommend it highly. You can order it online HERE.